The Risks and Benefits of Foreign IPOs in the U.S.
I’ve been curious as to what risks or benefits an influx of foreign IPOs means for U.S. markets and companies. Chinese IPOs have been a major focus this year as a number of Chinese companies, including Alibaba, Weibo, iQiyi.com and JD.com, are expected to list in the U.S. again this year since the delisting of 20 Chinese companies in 2011 and fears around accounting fraud and country risk. In the past two years, only 11 Chinese companies have listed on U.S. exchanges. Foreign companies see the opportunity to obtain access to a more liquid U.S. market by listing in the U.S. and are able to do so without having turned a profit. Additionally, there is strong interest in the dual-class ownership structure allowed in the U.S., which enables a company to issue more than one class of shares with different voting rights. As such, ownership in the company may be the same for individuals but the voting rights would be uneven, typically granting more voting rights to the management team (e.g. Google and Facebook structures). My initial thoughts were that there could be a long-term negative impact from the growing number of foreign IPOs in the US because of the looser corporate-governance standards to list and post-IPO underperformance as a result of country risk and pre-IPO overvaluations fueled by increased investor risk tolerance and information asymmetry. My research has both confirmed these concerns/risks and also suggested a more positive outcome. Below is a summary of my research. Since 1990, the US stock market has been shrinking in number of publicly listed companies, from a peak of 8823 in 1997 down to ~5000 in 2012 (see chart below). There is fear that a continued shrinking stock market would limit the number of companies that investors could buy shares in, impacting the value of the stock market and inflating stock prices. This phenomenon could also cause investors to increase their investment activity abroad on foreign stock exchanges, decreasing trade volume in U.S. exchanges. Foreign IPOs would help increase the supply of equities on U.S. stock exchanges and bring in more foreign investors, helping boost the U.S. IPO market (liquidity, encourage domestic ipo activity, increase ipo fee activity, etc.). Data on Initial Public Offerings: Foreign IPOs in the U.S., 1988-2012 here. Country risk and asymmetric information along with fears of financial fraud are the main investor concerns for foreign companies. Studies have revealed that foreign IPOs on average underprice more than matched domestic IPOs and this can be attributed to the above listed uncertainties. Underpricing occurs when the offer price of an IPO is set at a significant discount to its first-day close price. Recall the Baidu IPO which was offered at $27 per share and closed at $122.5 on the first day of trading, giving a first-day return of 353.85%. Based on a study conducted on Chinese firms in the U.S. between 1993 – 2010, it was found that these firms generally underperform the benchmark and industry peers in the post-IPO period of 3 years. There is a general belief that IPO firms typically experience a significant underperformance relative to their benchmarks in the subsequent 3 to 5 years after issuance. This suggests that asymmetric information is both driving down initial pricing and causing underpricing. Transparency has been a top priority with a number of firms having delisted due to discovered accounting fraud. Other reasons include stock underperformance below the exchange performance requirements or failure to comply with financial reporting requirements. As mentioned above, there were a number of Chinese firms that delisted in 2011 because of financial fraud. Delisting of companies not only increases distrust of foreign firms, but also results in investor losses as ownership of stock in the company doesn’t change while stock prices further decline as a result of the delisting. Additionally, delisting would exacerbate the already shrinking stock market by reducing the supply of equities and increasing the perceived risk of listing on that exchange by future potential issuers. Fear of a repeat of the 2011 Chinese firm delistings and lingering fears of financial fraud has resulted in an increased emphasis of transparency by foreign firms and compliance to U.S. financial reporting standards. Strict enforcement of rules to improve transparency and compliance to these standards by foreign firms would help create a healthy IPO market and encourage more foreign firms to list on U.S. exchanges. Investors are also cautious of complex ownership structures that allow management to retain more voting rights and allow for too much decision-making power. These structures are difficult to understand and hinder communication of decisions between the shareholders and management (even more opaque with foreign firms). The long-term performance of firms with these structures will depend on the success of management’s decision-making abilities to ensure trust among its shareholders, but changes in management will also create instant concern of future decisions among shareholders. The long term implications of these structures are uncertain but some studies have shown that ownership arrangements like dual-class structures have not historically performed better than arrangements where voting rights are equal for all shares (Paul Gompers, Joy Ishii and Andrew Metrick conducted a study of American firms with different ownership structures between1994 to 2002). 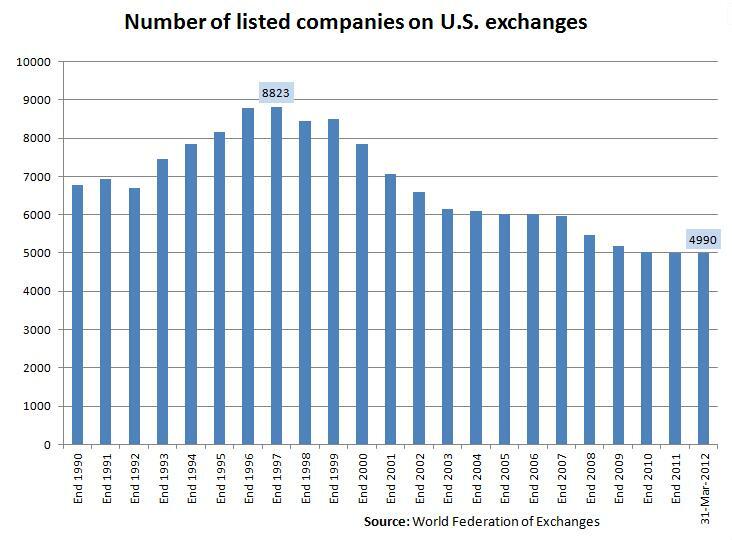 I think increased foreign listings on U.S. exchanges are a positive sign for the U.S. as foreign companies identify a healthy and trustworthy market in the U.S., but whether the long-term effects are positive or negative will rely on transparency and the long-term performance of these foreign companies.